Put your green juice down, push your smoothie aside, it’s time to go back to basics. Lemon water, literally water with freshly squeezed lemon, is the new super beverage. It’s the go-to hydrator for the A-list, from Gywneth Paltrow to supermodel Miranda Kerr to fitness guru Jackie Warner, and already many of us non-celebrities have discovered the merits of this refreshing, citrusy beverage. 1. Lemon helps the liver to dump toxins by stimulating its natural enzymes. This promotes good health and helps keep the skin clear. 2. Citric acid can help eliminate calcium deposits in the arteries as well as pancreatic and kidney stones. 3. Lemon provides a huge dose of the free radical fighting antioxidant vitamin C, which helps keep skin even-toned and wrinkle-free. 4. Vitamin C also helps boost the immune system, keeping the flu and colds at bay. 5. Lemons are a good source of electrolytes, such as potassium, calcium and magnesium, which help hydrate the body and regulate its functioning. 6. Lemons are rich in flavonoids. Flavonoids not only help boost the potency of vitamin C, they improve blood flow, helping to maintain normal blood pressure and reduce inflammation. 7. They help balance your pH level. Though acidic to the taste, lemons are alkaline-forming on the body. 8. Lemons contain modified citrus pectin and limonoids, which have been shown in a recent study to prohibit the spread of cancer cells, slow cancer cell growth and induce cancer cell death. Though green juice and fresh smoothies should still feature in your daily diet, it’s time to start knocking back a little lemon water. So, pull out your pucker face because things are about to get sour. 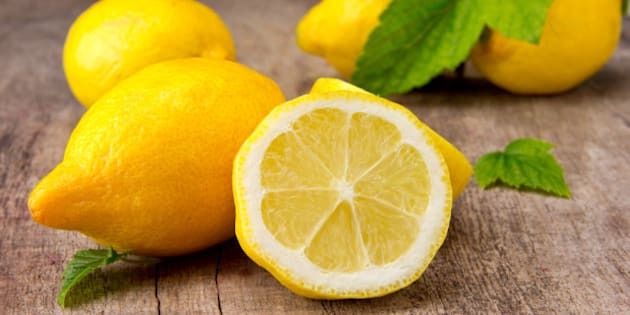 Bonus tip: Each morning, wash a lemon and squeeze its juice and pulp into a pitcher of room temperature-to-warm water. Let rind float in water. Drink. Repeat if desired.